I’m thrilled to share with you today this look I put together with pieces from Lulu’s. I have featured items from their site on PPF before – so I was excited when they contacted me about collaborating on a head-to-toe outfit. I love their affordable approach to fashion & that they have so many on-trend styles…which made it hard for me to choose! In the end, I decided to go for a more sophisticated look with versatile pieces I can wear all summer long. This vegan leather top is so unexpectedly lightweight that I have a feeling it will be in heavy rotation in the months to come. And this printed maxi skirt is the ideal breezy piece that can be dressed up or down. In addition to what I’m wearing here, I adore this perfect lace dress or this party-ready style. They also have an amazing selection of shoes that are very reasonably priced – currently loving these cutout heels & these leopard ankle-strap flats. See something you like? Lulu’s is offering an exclusive discount for PPF readers! Just use code PENNYPINCHER at checkout to get 15% off your purchase sitewide now through June 12th (case sensitive; US & Canada only; one-time use). You get free shipping on orders of $50 or more & free returns! I just ordered this woven clutch for myself – such a fun color for summer. that clutch is soo pretty! love how it pops against the rest of the outfit! Very cute outfit!! Love the skirt.. In every single post I see on your blog, you look absolutely gorgeous, sophisticated and stunning. I would love to have all of the clothes you wear! I have heard of lulus.com for years, but I just made my way to the site just last week and I am loving so many prices! This offer is perfect, since I was planning on purchasing quite a few things! Oh, and also love your outfit, you look stunning! What gorgeous pieces. I can see you having lots of fun mixing working them into your wardrobe. P.S. I am hosting my 1st giveaway, please stop by and enter. Gorgeous! I love the maxi skirt so much. 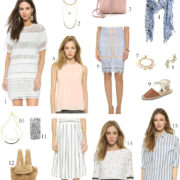 Beautiful Summer style!! And that clutch and heels are amazing! I love Lulu's so much, they have affordable, cute, and trendy outfits. Very elegant, you look beautiful. Loving this look on you Kim- very classic and feminine. Plus, the heels are a knockout! Love the faux leather in white!! 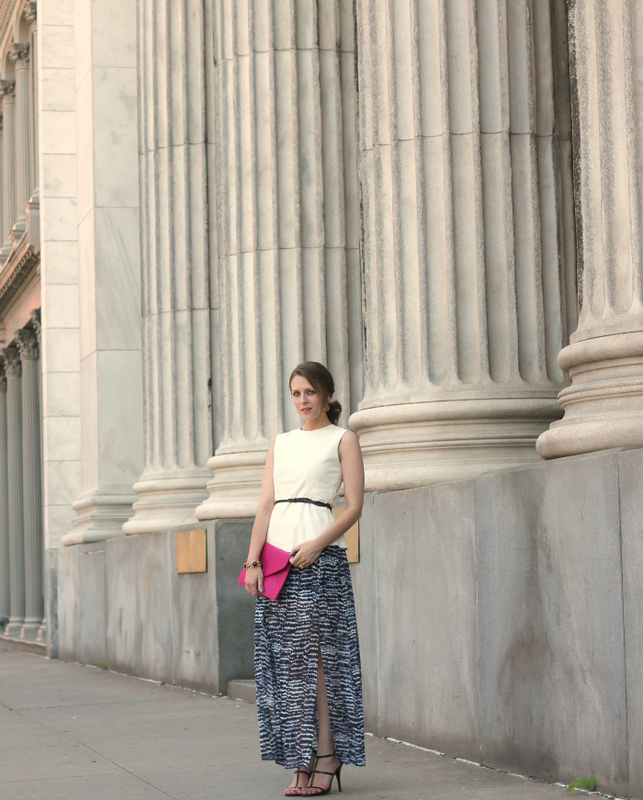 And that maxi skirt is beautiful- love a good flowy skirt! Those heels are exactly what I've been looking for! Love this whole look- especially the printed skirt. Love the double slit in maxi dress. This print and color is beautiful on you. I love the way you styled it. Very chic. If you get a sec, check out my latest post 'Holy Chic'. I would love to read your thoughts on how I styled it. Love this skirt and these heels..wow! I have seen Lulu's stuff all over the blogs but never got anything yet..You are inspiring me to buy everything you are wearing today:-) Hope you are having a wonderful day! Such a cute look and such a fun collaboration! Very pretty! checking out this skirt ASAP… it's awesome. SO great for work like you styled it, or perfect for weekend wear, too. Loving that clutch and those heels! I love this look Kim! That skirt is so pretty and those strappy sandals are perfect! Such a gorgeous look! I love that pretty skirt. Loving your floaty skirt, it's perfect for warm weather! I also really enjoy shopping at Lulu's, like you said they have so many trendy pieces. I am loving the way your strappy black heels and your bright pink bag play off each other. Loving this look dear!! You look stunning! I love that the bracelet and clutch! I like where the skirt hits you too, and that it shows off your pretty heels! Fabulous outfit, i love your skirt, you have a great blog, what about follow each other ? Let me know on my blog ! Love the pop of pink! Plus, your heels are hot! You are styling! this is such a stylish and chic look! i am obsessed!